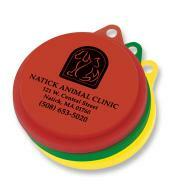 With your firm imprint or logo, our promotional pet products, make great promotional items. See our wide choice of pet products below. These items will make a big impression to promote your business by advertising with promotional products.. This means that everyone will see the pet products with your company imprint or logo, use them, and think of your firm when they need your product or business. It is also a great way to promote a specific event. Lowest price starting at: $1.55 each. Description: Easily dig out pet food with large paw shaped scoop, which also tightly seals pet food bags. Features 1 cup size to help manage portions. There is a 6% surcharge on orders shipped to California. Lowest price starting at: $0.39 each. Description: Reseals most common food and pet food cans from 3 oz to larger family size cans. Features a convenient pull-tab for easy removal. Top rack dishwasher safe. There is a 6% surcharge on orders shipped to California. Lowest price starting at: $2.61 each. Description: The ultimate travel bowl for pets on the go. Collapses flat to stow or transport. Use clip to easily attach to leash, backpack or belt buckle. Ideal for pet food companies, pet stores, veterinarians, dog shows and any company that supports the hunting industry. There is a 6% surcharge on orders shipped to California. Lowest price starting at: $1.35 each. Description: Smart new combo scoop and bowl. Ideal size for larger dogs. A perfect promotion for pets and the people who love them. There is a 6% surcharge on orders shipped to California. Lowest price starting at: $1.67 each. Description: Easily attaches to leash or belt loop with carabiner. Refillable compartment holds 20 biodegradable disposable bags. Fits most store purchased bag refills. Ideal for pet stores, veterinarians, groomers and dog shows. There is a 6% surcharge on orders shipped to California. Lowest price starting at: $1.19 each. Lowest price starting at: $3.19 each. Description: Be prepared for any pet emergency. Kit includes 3 antiseptic towelettes, 4 swabplus ear cleanser swabs, 2 2"x 3" non-adherent pads, 2 2"x3" adhesive pads. 1 set of gloves, 1 tweezers, 1 roll of tape, 1 scissors and 1 pet care guide. There is a 6% surcharge on orders shipped to California. Lowest price starting at: $1.51 each. Description: Paw shaped scoop for cleaning cat box. Sturdy construction with long handle. Ideal for pet stores, veterinarians and cat shows. There is a 6% surcharge on orders shipped to California.